1. the state or condition of being a partner; participation; association; joint interest. 2. an association of persons joined as partners in business. Behind every successful meeting or event is a partnership to tie it all together. Whether the partnerships are with the venue, speakers, production company and others, cultivating these business relationships is crucial to planning a meeting. In this Education Essentials, you'll learn why transparency and openness matters in partnerships, how to develop positive working relationships with production companies, what you should consider when working with a speaker bureau and how to recognize your partners' contributions. By being transparent and open with your partners, you are setting the groundwork for a more effective and pleasant process to safeguard the success of your program and ensure a win-win outcome for all parties. For meetings professionals, it can be as straightforward as sharing room block pick-up history for your program, prior event attendance numbers, minimum room square footage requirements and previous agendas. Instill an environment of trust and relationship-building within your team throughout the meetings and events community, and remember to be open with your partners. 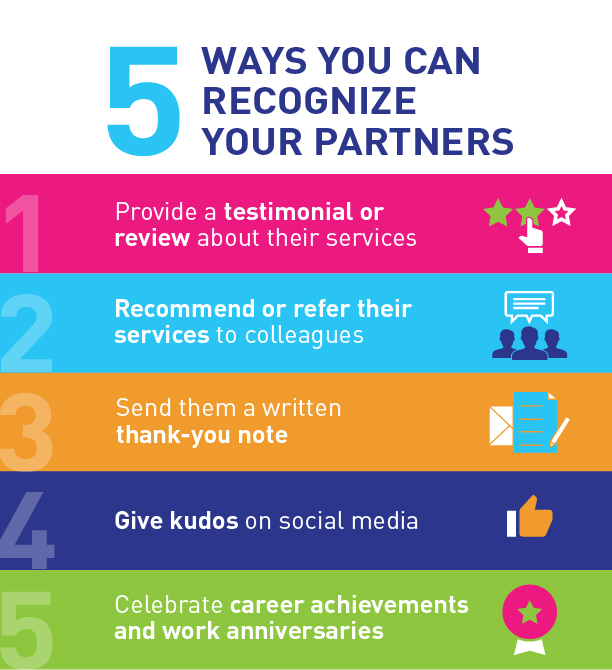 Loyalty grows out of trusted relationships resulting in mutually beneficial situations for both you and your partners, allowing both organizations, and “you,” to shine in the long-run. Read more about how you can incorporate transparency in your relationships with partners. When we partner together, our industry is stronger. Learn more about FICP’s partnership with the Meetings Mean Business Coalition as well as Executive Director Steve Bova’s experience sitting on U.S. Travel Association’s Board of Directors and his takeaways for what you can do to add to the collective voice of the meetings and incentive industry. In this FICP short from Jennifer Ashburn and Kimberly Gallagher of VDA Productions, you will hear tips for meetings professionals to create great working relationships with production companies. Whether you book your speaker direct or through a speaker bureau, it's important to develop positive working relationships with these key partners. Here are some considerations when working with a bureau, or with a speaker directly, from the 2017 FICP Winter Symposium panel recap, How to Leverage Speakers from the Start to the Finish Line. The recap emphasizes the importance of creating dialogue around what you're hoping to get out of their speech, providing enough information to help the speaker better understand the audience and, most importantly, reviewing basic logistics. If you're at the point of negotiating speaker fees, be sure to catch the notes on the FICP Fall Symposium education session, Master the Art of Negotiating and the World Is Your Oyster, which will teach you how to master the negotiation experience. FICP is a CMP Preferred Provider. What does that mean? At each FICP event, you have the opportunity to attend sessions that are pre-approved by the Events Industry Council for CMP credit. In 2017, FICP revamped its CMP Center to provide guidance on how meetings professionals can earn CMP credit at FICP events. We are committed to delivering education that helps you earn or maintain the CMP certification.